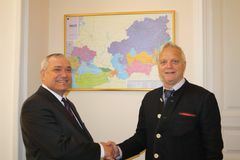 On 21 April 2015, in the premises of TRACECA Headquarter Mr. Mircea Ciopraga, Secretary General of the PS IGC TRACECA met with Dr. Franz Goetz, Team Leader of the "Assessment of the EU-funded TRACECA programme" project. The specific objective of the project is to provide an evaluation of the TRACECA programme in the period 2007-2014, with identifying key lessons pertaining to the impact of TRACECA projects. The evaluation needs to be carried out at two levels, programme and project. Dr. Goetz briefed Mr. Ciopraga about both levels of the evaluation process. The evaluation should focus on the background and the impact of the policies, strategies, management and institutional set-up of TRACECA to date, with a view to propose strategic options for future years. At project level, the methodological differentiation needs to be made between the different projects. In addition, there are a number of specific issues of a great importance for the assessment. Particularly, review of the relevant documents, including EC original strategy documents, Terms of References, projects' final reports, monitoring and or evaluation reports of individual projects, results of previous EU-funded evaluations of the TRACECA programme, carried out in 1998, 2003 and 2007.
b) further strengthening cooperation and communication between EU, projects and PS IGC TRACECA. Mr. Ciopraga supported the idea of the Team Leader to ensure strong legal basis and to improve effective implementation of the TA projects subject to the needs of the beneficiary countries. Participants of the meeting touched the issues of the political process in the region and operational activities in the context of the European Neighbourhood Policy and the Eastern Partnership (e.g. EaP-Transport-Panel, TEN-T extension, AA/DCFTA Agendas, EaP-IBM-Flagship Initiative). At end of the meeting parties agreed to exchange views on the permanent basis within the whole period of the evaluation process.